Compliance management software is a business system that centralizes, consolidates, automates and streamlines processes, files and communication relevant to an organization’s adherence to meeting government and professional standards and regulations required in their industry. This type of software helps you manage risks, deploy an optimized workflow and empower staff with greater visibility and knowledge on compliance requirements to steer your organization away from costly penalties or, worse, shut down. Compliance is a necessary burden for any organization, especially in industries that impact public welfare greatly. Whatever your industry is, you are likely faced with policies, legal frameworks, environmental and health standards, and more. This is good, in fact, because it helps you attain operational excellence, upholding human and social integrity, and capturing best practices for the good of all, including your business. But compliance is also Damocles’ sword hanging above your business: one mistake and off goes the sword. Enter the technological solution for this. What is compliance management software? It is a system that automates and centralizes all work processes relevant to the administration and management of compliance requirements, process and workflow deployment, risk management, and overall compliance management. Compliance management software helps you and your company capacitate your people with the necessary knowledge and skills to effectively implement your company’s risk management framework. You no longer have to burden yourself with unnecessary grunt work, hefty operational costs, and paper trails. 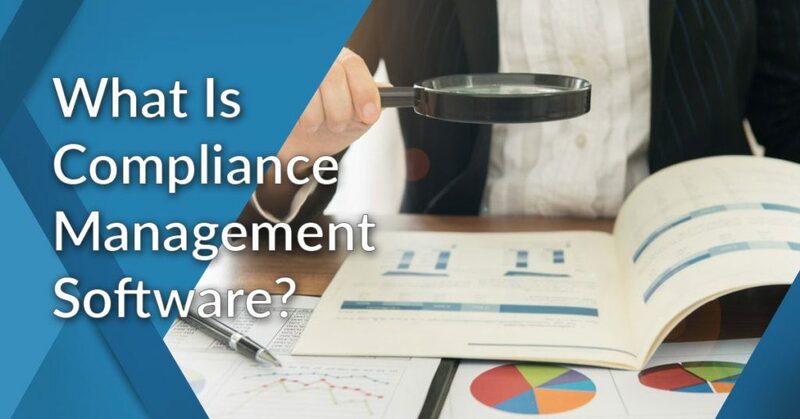 In this article, we’ll take a look at some of the more successful compliance management systems in the market as well as a brief rundown of why you should invest in compliance software. What Are Examples of Compliance Management Software? What Are The Benefits of Compliance Management Software? What Are The Types of Compliance Management Software? What Are Popular Features of Compliance Management Software? What Are Factors to Consider When Buying Compliance Management Software? What is the Pricing of Compliance Management Software? What Are Potential Issues in Compliance Management Software? Since 2016, more than 52,000 international regulatory changes have been introduced and since 2008, financial institutions have shelled out $204 billion in fines and infractions. Fines can also be huge in the healthcare industry. One of the most prominent cases of non-compliance is the New York-Presbyterian Hospital case, which was slapped with $2.2 million fine for unauthorized filming of patients. Therefore, any business must strive to meet these requirements because reputation and money are on the line. However, it is always easier said than done. As your business grows, there exists a need for more compliance requirements, thus more people to deploy for its implementation in the program cycle. It also means more paperwork, more tasks delegated, more communication lines open thus more costs for your company. Luckily, compliance management software makes life easier to meet regulations head-on. In fact, the following best practices to manage compliance costs below can easily be implemented with the right software tool. Form.com Restaurant Inspection. Form.com is the definition of compliance management software that is industry-specific. It helps restaurateurs ensure their rapid data collection, operational excellence, and excellent brand experience, especially for purposes of vendor and supplier inspections, Environment, Health, and Safety compliance, and customer feedback. You can be assured that you can easily deploy solutions for continuous improvement while implementing corrective actions through a plethora of tools such as form builders, automated actions and notifications, and robust data collection methodologies that have offline access and consolidation capabilities. You can sign up for a Form.com Restaurant Inspection free trial here. Thomson Reuters Compliance. A holistic compliance management software that gives you the power to adapt data and process models, access innovative and out-of-the-box solutions, and a comprehensive library of policies and compliances that you can integrate to your organization’s contexts and requirements for better efficiency and operational standardization. The Thomson Reuters Compliance software also equips you with the tools for tracking compliance changes and regulatory alterations to ensure that every compliance change is implemented in the project cycle, thus protecting you from all forms of business risks. Promapp. Promapp elevates your organization’s overall efficiency and risk management by offering a diverse set of solutions designed for process and compliance management: a simplified process management system that lets you organize processes you own and manage; process approval workflows to help you and your team configure and enhance business processes; a personalized dashboard and centralized systems to ensure team collaboration and implementation; and the power to visualize processes into easily digestible maps and flowcharts. Another key functionality of the software is that you can have a quick glimpse of process health. You can track processes collectively and monitor processes that are in progress, awaiting approval, and more. Through a thorough risk management functionality, you can also embed control points in your processes and ensure that these controlled processes are owned and delegated. Compliance 360. Compliance 360 offers an integrated approach to risk management by giving businesses a full view of risks across levels. One of its key offerings is its incident management capability. Through this incident management capability, you can capture incident details and audit findings, promote accountability, and establish a clear and streamlined process for resolving issues and incidents for your business. The software also comes with a set of tools for vendor and operational risks management, ethics and compliance learning, and digital risks. DIGI CLIP mobile forms. DIGI CLIP mobile forms helps users graduate from traditional paper-based processes and utilize an intuitive and innovative way of creating, using, and re-using their custom forms. Whether you plan on creating custom forms for your audits, checklists, or other purposes, you have complete control on the content, appearance, and layout of your forms without the need to deal with with complicated codes. Pre-configured templates are also available to save precious time and resources from building forms from scratch, and you can tweak and modify them accordingly to fit your branding. If you want to find out more software solutions in this field you can check out our 10 most popular compliance management software comparison guide. Form.com helps you ensure your restaurant is compliant with both internal and external requirements. So, what does compliance management software do? More specifically, why use compliance management software? Before delving into that, it is important to first understand the very core of compliance requirements and why they matter. Compliances are basically legal, social, environmental, and financial standards that aim to protect an industry’s or business’ integrity, accountability, and overall standing in a particular sector. The definition may also be in terms of regulatory requirements designed to protect employee rights and welfare, environmental integrity, and financial transparency. However, any policy or institutional arrangement that carries severe penalties and risks due to non-adherence may be defined as compliance. Reduced legal problems. This is one of the advantages of compliance management software. All business have to follow certain legal, financial, environmental, institutional, corporate, social and government policies and frameworks to be able to operate and avoid lawsuits, fines and penalties. There also must be an established platform to implement these compliance requirements, as policies only gain power if they are enforced and implemented to the fullest extent. An integrated compliance software ensures that these compliance requirements are fully integrated across all processes of the organization and that no gaps are left open for risks or crises to slip through. Enhanced operations and process efficiency. Any organization must strive for innovation and continuous improvement to prosper and succeed. These may include annual internal and external audits and feedback solicitation and frequent evaluations. Based on eventual audit findings, checklists, and evaluations, the organization must be able to report points for improvement and quality and performance inconsistencies. Compliance management software helps ensure that these areas for improvement are well-documented and communicated across teams, locally or globally. Facilitate informed and compliant decision-making. Through compliance management software, it will be easier to make decisions where the company’s legal and financial integrity are at stake. A compliance management software helps escalate these scenarios to the system and delegate it to the officers involved so they are resolved immediately. Better brand and company reputation. Customers appreciate businesses that are socially and environmentally-conscious. For instance, if your business perpetuates a culture of hiring people regardless of culture, sexual orientation, color, etc or adherence to certain health and environmental standards, then you may tout these compliances in your marketing collaterals, thus giving you an edge over your competitors. A business that prioritizes employee welfare and rights also has an edge over businesses who do not practice sound employee management through industry regulations and provisions. A good compliance management software ensures that these compliance requirements are considered and met. Effective team collaboration and communication. Employees and leaders are at the forefront of confronting risks, observing inconsistencies in the systems, and meeting compliance requirements. This is why there must be a centralized and simplified process for communicating these requirements and inconsistencies so that they are captured, delegated, and implemented effectively. Compliance management software ensures that there is a clear and seamless practice of capturing and relaying issues and incidents among a diverse set of people. Thomson Reuters Compliance provides you with a wide range of regulatory learning courses. All-purpose platforms. These provide you with a general set of tools for compliance management. How does compliance software work? To answer that, we look at its core features. Businesses seeking to invest in compliance management systems must realize that features will vary depending on business thrusts/specialization as well as specific business processes. We have, however, compiled most of the functionalities or features available in compliance management software. User-friendly interface. Social media platforms and digital marketing have impacted the way we approach information on the web. A good compliance management software must be intuitive but easy to use. The software must simplify usage by providing a positive user experience. This can be seen through a software’s overall design finish, organization and packaging of features, and relevance of features to the end-users. Qualitative analytics, Compliance officers bear a huge responsibility of protecting company reputation and assets by leveraging big data. An effective compliance management software must offer a way to visualize and present trends and resolutions so these are escalated to upper management with ease. Fraud management. In the case of suspicious activities, a compliance management platform ensures that fraudulent activities, including vendor payments, bribery and fraudulent acts, and anomalies in the financial accounts of the business, are well-accounted for, reported, and resolved. Document controlling. Some compliance management software feature the capability to facilitate better document controlling, which entails the steadfast management of records, forms, and documents that a business releases or receives. Document controlling is a major requirement of ISO 9001, and some businesses may consider looking for this feature to help them manage the quality of documents and records. Process management, Any business must strive for continuous improvement. Some compliance platforms have functionality for owning, managing, remapping, and dissecting processes while making the management activity seamless, integrated, and collaborative. Processes can also be visualized through mapping and flowchart tools so everyone is speaking the same language. Incident management. A compliance platform offers a simplified and streamlined process of escalating issues, incidents, and events and a seamless way of resolving these through a well-designed communication algorithm. Capacity Development. There must be a learning system in place so compliance officers are equipped with the know-how on various compliance requirements set by regulatory bodies and commissions. Electronic and web-based database of compliance requirements. Compliance platforms should have a centralized system for gathering compliance reports, changes in regulations and requirements, and a steadfast process of integrating these into the business process. Compliance reporting. Compliance management software must be capable of producing an array of data extracts and compliance reports and ensure that these are packaged well to be actionable by upper management. The reports must also be easily customizable and filtered to ensure reliability. Task management and workflow. Helps businesses save up on time and resources and manage compliance tasks with end-to-end workflows across different points of contacts. Risk management. Effective compliance management platforms offer a systematic way of managing risks through monitoring and analysis of risks throughout the value chain and other key business processes. Secured data. Compliance platforms must ensure data integrity across all levels of the value chain, assuring key stakeholders that data integrity will not be compromised in any way. Moreover, there must also be a seamless process of protecting data through encryption, advanced security systems, and easy integration and transfer of data. Offline capability. Other compliance management systems offer a methodology for gathering and consolidating data even without access to internet connection. Such functionality enables businesses to operate seamlessly without having to think of technological hindrances in their initiatives. Compliance building platforms that feature a form builder typically have this integrated within the system to ensure that data captured remains integral and accurate regardless of location and business type. Integration capabilities. When choosing a solution to adopt, ensure that your chosen solution is capable of integrating with third-party and supporting systems, including HR, CRM, trading systems, research systems, and more. Automation requires efficiency, and a suitable compliance management software should save up your time, energy, and money so you can focus it on what matters more: policy formulation, compliance strategy, and overall compliance management. Promapp helps you to create a clear process flow to meet compliance requirements. Business specialization. Some compliance management platforms cater only to regulated industries like healthcare, financial services, etc meet certain legislative requirements while others are built up as generic solutions for compliance and risk management. It would be very useful to lay down all your business requirements, questionable activities, issues to address and request several vendors for a demonstration to be able to make an informed choice. Compliance requirements. What regulations, policies, and legislative and financial frameworks do you follow? Have a rundown of all these compliance requirements so you and your team can check established products that may have integrated all the requirements, meeting your business requirements. Organizational structure. Determine your organizational capacity and see how the platform would fit into the bigger picture. How will your chosen platform integrate with the organization’s teams? What organizational silos will it aim to restructure? Do you have to communicate with other departments who may have their own compliance teams and systems already in place? Data security. Data is king. Make certain that the platform you will choose has capabilities for securing data integrity, cross-network data and system integration, and a process for backing up data. A mature security framework ensures that client expectation and data integrity are met. After all, loss and compromise of data will cost you your customers, and possible, your entire business. Integration. Integration capabilities provide you a seamless, effortless experience by saving up on costs. The compliance management software must be able to integrate fully with many trade systems, research systems, HRM and CRM systems, and various others. Also the software you choose must be able to operate well across various silos and locations in your business. There is not much variety in the cost of compliance management software. Majority of the compliance management systems you will see on the market offer quote-based plans. Mismatch of requirements. As a potential client, check your process and compliance requirements to see if it is in line with the product’s key functionalities and offerings. It would also be worth evaluating the subsystems and technologies in place to get a good glimpse of compatibility between your current systems and the systems you’ll adopt. Issues may arise when systems are outdated or mismatched with your requirements. Would there be any maintenance costs for the systems you’ll adopt? How advanced or updated are the current systems as per the industry-wide compliance requirements? Loss of data. Data gives any businesses a competitive advantage. If your adopted system does not embody a data integrity framework, a lot will be compromised: legal fines and penalties, public relations, brand identity, data and customer identity theft. This is why it’s particularly important to know first hand any procedure or processes to safeguard sensitive information and data.